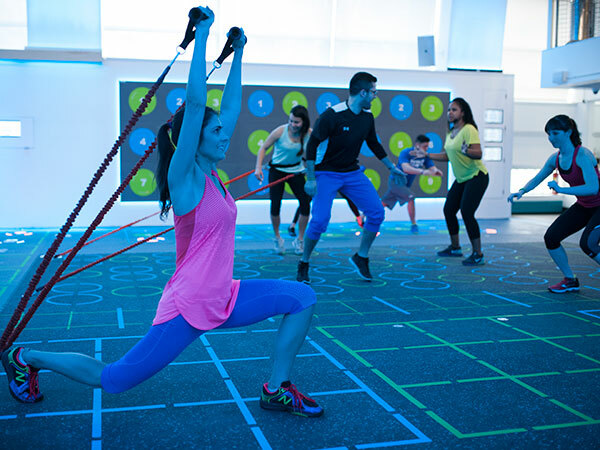 Welcome to Asphalt Green's newest interactive gym platform, AG6, a workout that creates a game-likeatmosphere by using pressure sensitive walls and floors that 'll light-up your workout. This new high-tech interval training uses PRAMA technology, Europe's hottest training regimen that was designed to "train all major muscle groups through movement with purpose, building endurance, strength, balance, speed, agility, reaction time, and overall fitness," according to Asphalt Green's website. The reaction-time driven technology was initially created to help people improve their basketball game. Spatial floor references along with the visual light cues were used to direct players on where to throw the ball during drills, allowing them to sharpen their dribbling, passing, and muscle-reflex. On the Upper East Side, the anaerobic exercise has transformed into a total-body fitness class, focusing primarily on improving overall strength and cardio. This 1,800 ft. athletic playground first opened in April 2016, showing HIIT devotees that interval training can be versatile and downright F-U-N. This touch-n-go workout burns up to 1,000 calories in 45 minutes, while allowing for a greater EPOC (excess post-exercise oxygen consumption) during the after-workout recovery period. This means you'll be burning calories long after you've completed your workout, thus increasing your metabolic rate. High-intensity fitness has gotten an upgrade with this Dave & Buster's spin. The only prizes you'll be winning here are sore muscles and a stronger core. By using LED lights and padded walls, you'll become immersed in NYC's newest fitness fad and quite possibly the coolest fitness class we've ever come across. Asphalt Green hopes you'll find your "competitor, teammate, or target," in the lights and sounds of AG6.